These figures were published in Stahle et al. (2013) Earth Interactions available here. Figure 1. This blue oak woodland is located on private property in Bear Creek Canyon, Tehama County, near the northern limit of the species distribution. The larger trees are in the 150–250-yr age range. Figure 2. 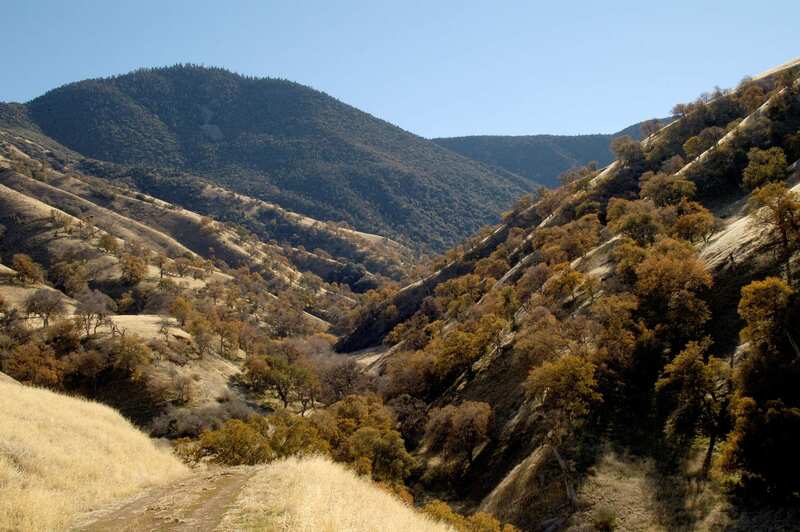 Ancient blue oak woodlands form the lower forest border between high desert grasslands and the mixed conifer zone along Los Lobos Creek in the Wind Wolves Preserve, a 90000-acre private conservation property at the southern end of the San Joaquin valley. Figure 3. (a) Blue Oak is a California endemic species and forms the lower forest border on the foothills that encircle Central Valley (distribution map from Grifﬁn and Critchﬁeld 1972). (b) Tree-ring chronologies were developed for 36 old growth blue oak woodlands (red triangles). (c) The tree species composition (i.e., blue oak percent of total basal area for all tree species greater than 10cm DBH; several sites only contained blue oak) and (d) proportions of blue oak trees at 32 old-growth blue oak stands in four age classes were estimated based on a random sample of 40 trees at each site that were at least 10cm DBH. Uncut blue oak woodlands with canopy-dominant trees over 200 years old are still widely present throughout its native distribution, especially in the South Coast Ranges and on the rough basalt mesas and slopes of the southern Cascades. Figure 4. 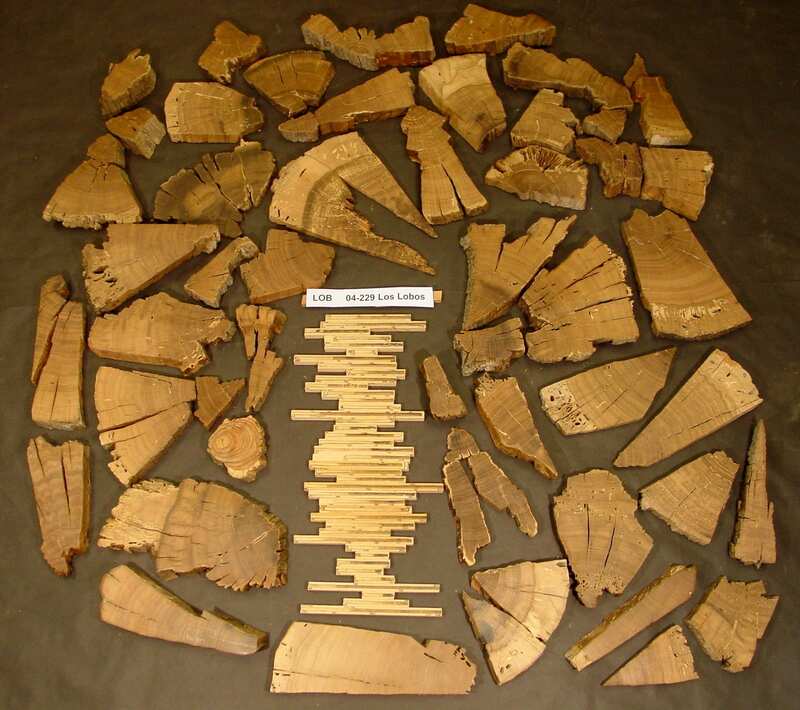 The tree-ring collection from Los Lobos Creek includes core specimens extracted non-destructively from living trees and small radial cross sections cut from fallen logs. The oldest living tree in this sample is at least 377 years old. The oldest dead log has 553 annual rings. The derived tree ring chronology extends from AD 1333 to 2004. Figure 5. A photomicrograph of the annual rings on a blue oak specimen from Rock Springs Ranch, San Benito County, California (12-mm-thick wafer stained with safranin to enhance ligniﬁed structures, in red). Growth proceeded from left to right (1581–87 shown here). Note the large-diameter vessels (white pores) that congregate in the earlywood portion of the annual ring and the dense heavily ligniﬁed ﬁber cells that dominate the latewood (red). The variation in annual ring width can be used as a proxy for water-year precipitation and other hydroclimatic variables in California (e.g., 1583 wet; 1585 dry). Figure 6. The recruitment dates for a random sample of 569 trees from 32 collection sites that included pith or were near pith are plotted in red, and the pith or near-pith dates for 793 random and selectively sampled trees are plotted in black. 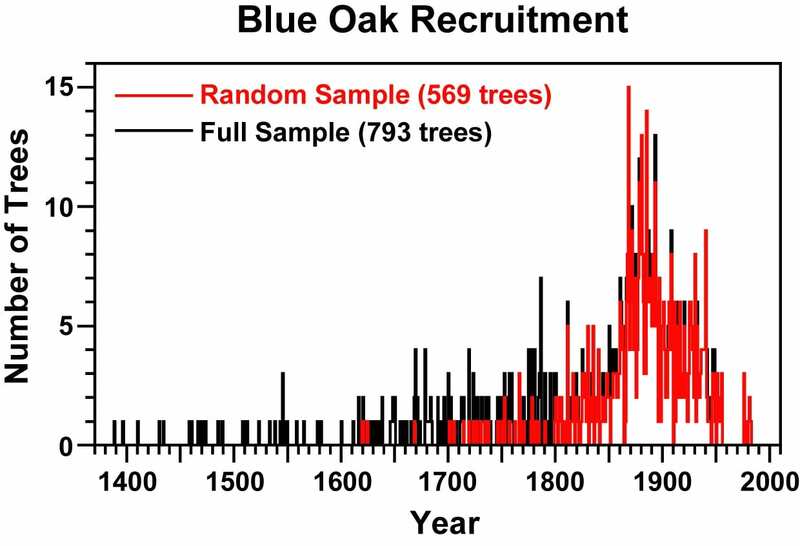 A strong peak in blue oak recruitment occurred during the late nineteenth century. These recruitment ages seriously underestimate true germination age (e.g., Koenig and Knops 2007) but are sufﬁcient to prove the great age of many blue oak trees still present in California. Figure 7. The tree-ring chronologies from Mt. Diablo, Rock Springs, and Los Lobos (white dots) were correlated with the seasonal precipitation totals accumulated from September through May at each grid point in the PRISM precipitation data-set from 1951 to 2003 (Daly et al. 2008). The PRISM data are based on weather station observations that have been distributed across the landscape with a grid spacing of 4 km, taking into account orographic and topographic effects on precipitation. Correlation coefﬁcients computed between these three tree-ring chronologies and the precipitation data at each grid point are contoured and color coded. Red shading indicates correlations above 0.70. Correlations above 0.80 are mapped within the light contour line; correlations above 0.90 are mapped within the heavy line. Figure 8. 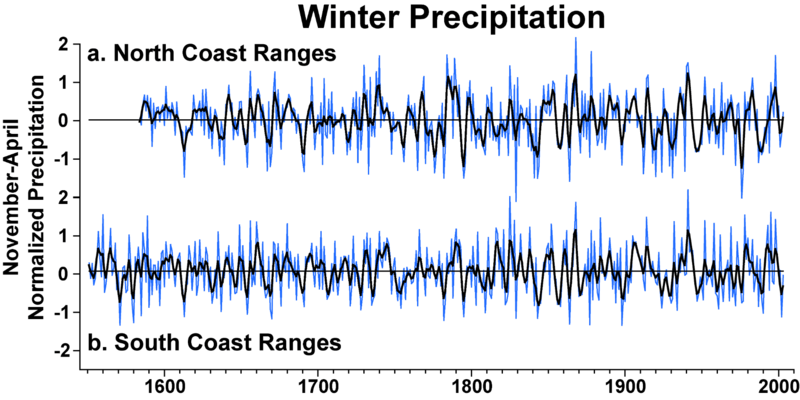 Three site-centered reconstructions were used to compute a regional average of winter precipitation for the (a) North and (b) South Coast Ranges. The site-centered reconstructions from Meko et al. (Meko et al. 2011) for Bear Valley Buttes (BVB), Putah Creek (PUT), and Mt. Diablo (DI2) were used for the North Coast Ranges; reconstructions for Palo Prieto Creek (PPC), Figueroa Mountain (FIG), and Los Lobos Creek (LOB) were used for the South Coast Ranges average (Figure 3b). All six individual reconstructions were well calibrated and veriﬁed against instrumental precipitation data (Table 1 of Meko et al. 2011). The annual estimates are plotted in blue and a 5-yr smoothed version is plotted in black (i.e., based on a cubic smoothing spline with a 50% frequency response of 5 years; Cook and Peters 1981). Figure 13. Observed and tree-ring reconstructed January–July near-surface salinity at Ft. Point near the Golden Gate, 1922–2005 (red and black curves, respectively). The Ft. Point record ended in 1994 and has been extended to 2005 based on regression estimates from salinity observations made at Point San Pablo (dashed line; with missing values; Buchanan 2007). The impact of drought and freshwater diversion are indicated by the high salinity measurements from the 1960s to the early 1990s (note the positive linear trend ﬁt to the observed data from 1922 to 2005 in red), particularly when compared with the tree-ring estimates based on precipitation/ streamﬂow forcing (black time series). The bay was freshened during the high runoff regime of the late 1990s. Figure 14. The blue oak reconstruction of January–July average near-surface salinity at Ft. Point is illustrated from 1333 to 2005 (gray curve; decadal variability highlighted with the black curve; note that drought and high salinity excursions are indicated above the mean, the opposite of low precipitation amounts in Figure 8). 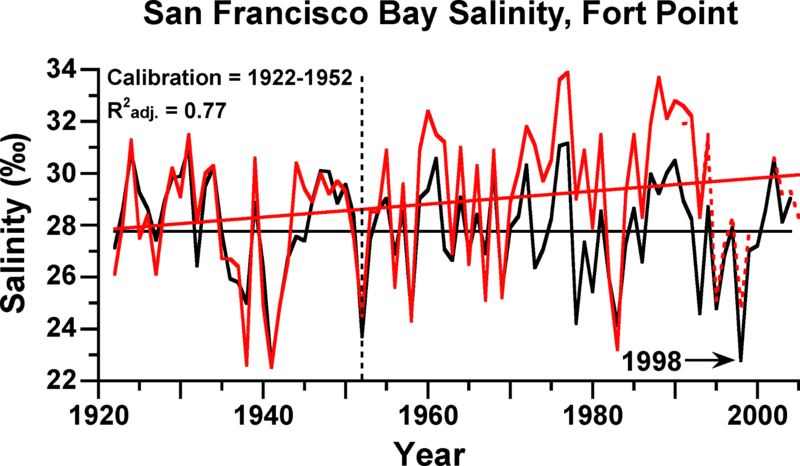 The observed salinity values measured at Ft. Point from 1922 to 2005 are shown in red. Note the high salinity extremes during the period of heavy streamﬂow diversion after World War II. High salinity extremes occur during drought, and the extremes witnessed during the 1976, 1977, 1988, and 1990 droughts have not been matched over the past 673 years. Low salinity extremes occur during wet years, including several El Nino events (e.g., 1868, 1941, 1983, and 1998). The tree-ring data suggest that salinity during the 1998 El Nino event should have been among the lowest seasonal averages in the past 673 years. Figure 15. 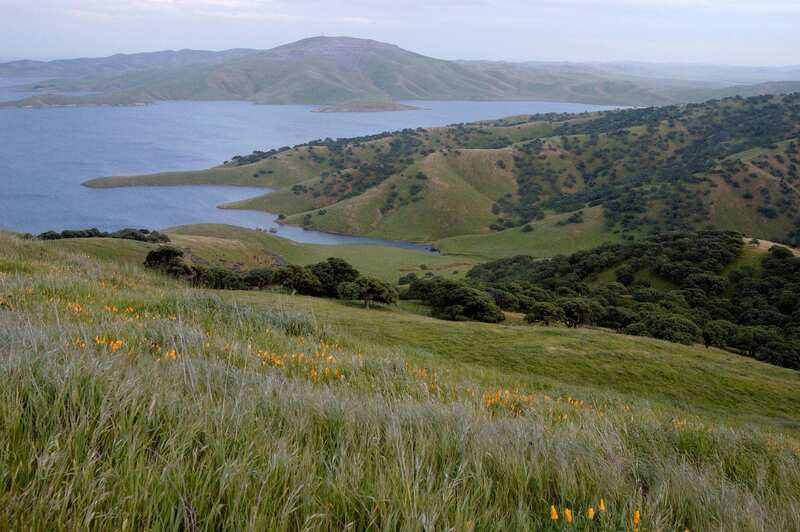 San Luis Reservoir in Merced County stores Sacramento–San Joaquin water diverted from the delta and bound for Southern California. 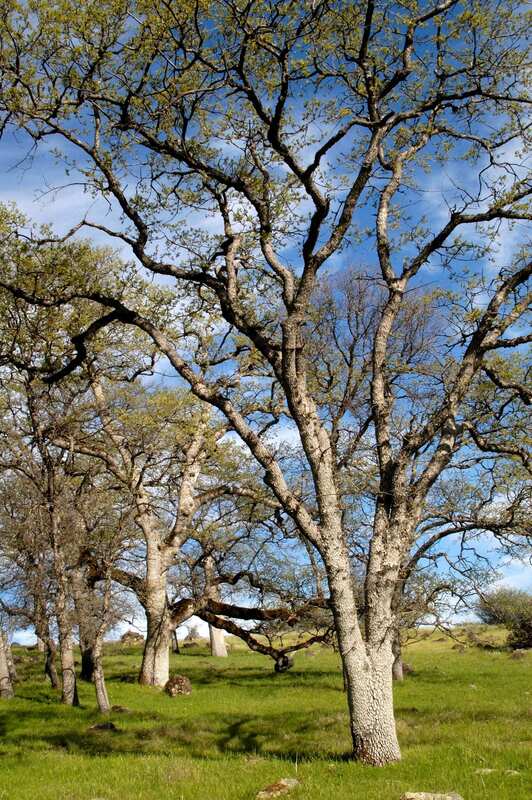 The blue oak trees shown here at Pacheco State Park and elsewhere provide long precipitation proxies that can contribute to the understanding and management of these vital water supplies. Figure 16. This 350-yr-old blue oak is located near the north fork of the Kaweah River in Sequoia National Park. 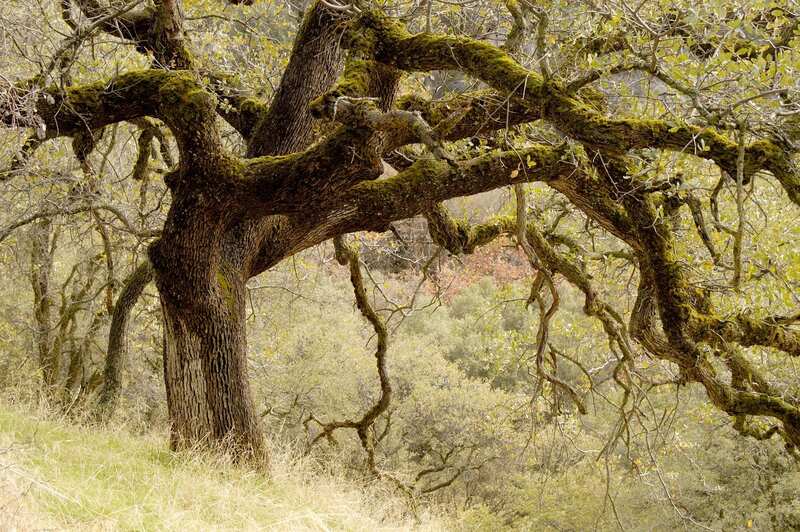 In a state and national park famous for magniﬁcent trees, the remaining blue oak woodlands of California are remarkable for their abundance, longevity, and environmental history encoded in their annual growth rings.